We had the 3G dual SIM version of the Lumia 640 XL, which supports dual-standby where one of the SIMs is hooked on a 3G network, while the other works on GSM mode. There is a LTE-capable dual SIM version, as well as 3G and LTE single-SIM editions. Our first tests gauges the 3G talk time endurance and the Lumia 640 XL easily aced this routine. The IE11 web browser, even though it scored unimpressive benchmark scores, was very fast when it comes to real life usage. We ran our script, which emulates standard browsing routine, and the Lumia 640 XL posted a respectable 10 hours endurance. Microsoft Lumia 640 XL did average on the looped video playback test, lasting 8 hours and 40 minutes before its battery juice drained down to 10%. The score is certainly affected by the screen that big but it still means you can enjoy 4 full-length movies. 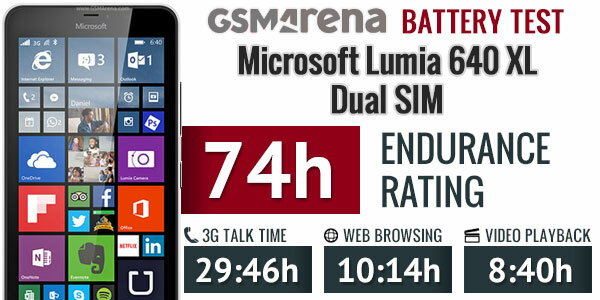 The Lumia 640 XL did great in our dual-SIM standby endurance test, lasting almost 11 days. If you decide to use just one SIM card, you’ll get an additional day or so. The Lumia 640 XL Dual SIM managed an overall rating of 74 hours, which means it will last three days if you do an hour each of watching videos, browsing the web and making calls each day. You can add an extra 2-3 hours to this rating by using it with just one SIM card. Our routine also includes a standby battery draw test, which is not featured in our battery test scorecard but is calculated in the total endurance rating. 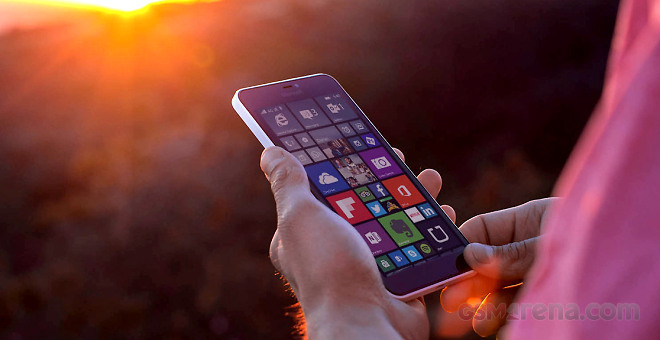 If you want to know more about the Lumia 640 XL, you can check our in-depth review.